The Neapolitan Mastiff (also known as the �Neo�, �Mastini�, or �Italian Mastiff�) is an Italian breed named after the region of Naples, where most of its development occurred. The Neapolitan Mastiff�s ancient origins are with the Molossians, an early Hellenic tribe known for its powerful guard dogs. In 326 B.C., King Porus of Punjab gave Alexander the Great a pair of Neapolitan Mastiffs which proved quite popular. These dogs were bred widely, producing many offspring which were adapted by the Romans as war dogs and fighters. They were also pit in the Arena against gladiators, bears, and even elephants. The dogs were later crossed with fierce British guard dogs, producing an even larger, more powerful breed resembling the modern Neapolitan Mastiff. It was discovered near Naples in 1946 by Piere Scanziani, who standardized the breed and promoted its development. Few Neapolitan Mastiffs arrived in America until the 1970�s. They were fully recognized by the American Kennel Club in 2004. Neapolitan Mastiffs have inspired portrayals in fictional literature including �Fang� from �Harry Potter� and �Pansy� from Andrew Vachss� series of Burke detective novels. The Neapolitan Mastiff has a shoulder height of 60-75 cm (23-30 in) and weighs 50-70 kg (110-150 lbs). It has a large, droopy, wrinkled head with large flews (upper lips) and dewlap (wrinkled folds beneath the chin), deep set eyes which are almost entirely covered by folds, and pronounced stop (depression where the muzzle meets the forehead). Loose folds of skin cover nearly the entire body. Neapolitan Mastiffs have a flat back, round feet, and low-hanging tail docked to two-thirds its natural length. The Neapolitan Mastiff has a short, dense, hard, fine, uniformly smooth coat. The Neapolitan Mastiff can be standard grey, leaden grey, dove-grey, leaden black, brown, fawn, deep fawn, light fawn, or hazel. White patches on the chest and tips of the toes are not uncommon. The Neapolitan Mastiff is confident, gentle-natured, and powerful. Bred as a guard dog, it is highly suspicious of strangers and protective of its property and family. It does not bark unless necessary. Neapolitan Mastiffs are intelligent, majestic, and noble. They do drool and tend to make a mess when eating and drinking. Neapolitan Mastiffs are very good with children if socialized early, but close supervision around young children is advised due to their massive size. The Neapolitan Mastiff generally gets along with other dogs and household pets, but socialization when young is recommended. Male Neapolitan Mastiffs may be aggressive with other male dogs. The Neapolitan Mastiff requires frequent cleaning of the dewlap area and facial folds. 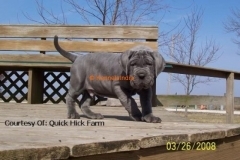 Other than that, the Neapolitan Mastiff coat requires little attention; dead and loose hairs should be removed with a rubber brush when the Neapolitan Mastiff is shedding. As with all very large dogs, the Neapolitan Mastiff needs a soft place to lie down to avoid pressure marks. The Neapolitan Mastiff has a short lifespan of 8-10 years, with larger dogs tending toward the lower end of that range. Common health problems for Neapolitan Mastiffs include hip and elbow dysplasia (malformed joints which can cause lameness or arthritis), skin infections, and cardiomyopathy. Bloat is another potentially dangerous illness which can be prevented by placing the dog�s food dish on a raised surface, spacing meals throughout the day, and avoiding exercise immediately after meals. Obesity can cause a number of problems for the Neapolitan Mastiff; proper exercise and nutrition are critical. Neapolitan Mastiffs prefer life indoors and are not well suited to hot weather. Neapolitan Mastiff training must be conducted in an atmosphere of mutual respect, with consistency and understanding. This breed is a bit obstinate, but will obey once it understands what is expected of it and recognizes its owner�s authority. Obedience training at a young age is recommended. Neapolitan Mastiffs are happy to learn, but may refuse to perform tricks they consider pointless. In spite of its large size, the adult Neapolitan Mastiff has only an average need for exercise. It enjoys walks or play in a large fenced-in yard. Puppy Neapolitan Mastiffs should not be over exercised�the Neapolitan Mastiff requires all of its energy to grow strong bones and put on weight because it grows very rapidly. Due to their large size and space requirements, Neapolitan Mastiffs are not recommended for small apartments.